An old friend of mine used to say she wanted to write spam for a living because: what else do you do when you’ve got a PhD in, basically, “how awesome is Shakespeare?” I remember those conversations; they usually ended with us agreeing that the good spam-writers work for Big Marketing. They’re really all just spammers, only some of them put on airs. What the heck is a “blooter”? Obviously, I went and checked in Google, but the definition of “blooter” that came back doesn’t seem to work right in this context. Also, “Gun-Carrier-Carrier Chief Editor” is a title that no man would want to bear. “Blooter” has got a Trumpian ring to it. Mr President, is that you? 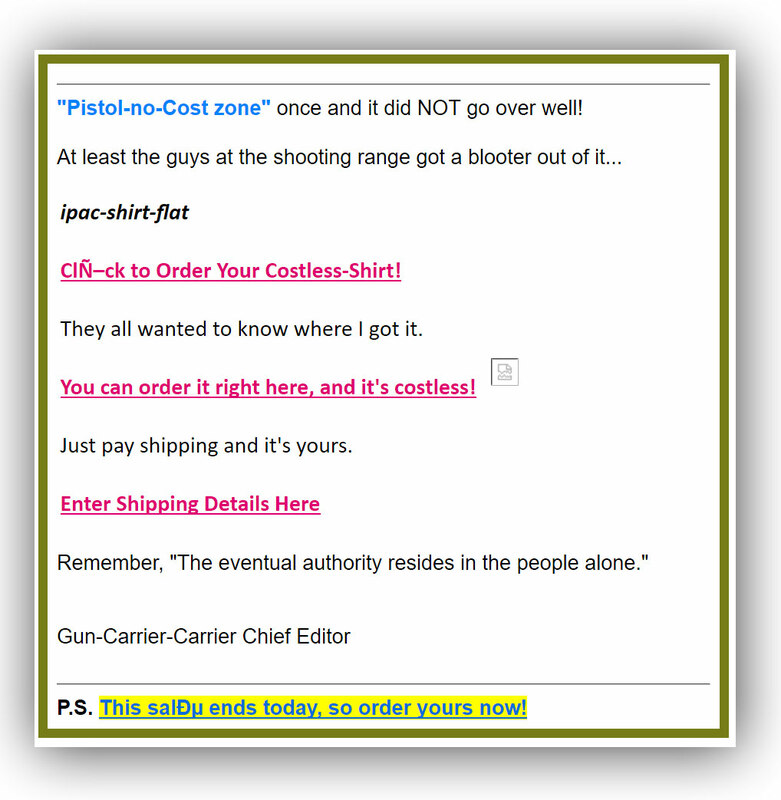 I take it the “pistol no-cost zone” was originally “pistol free zone”? “Blooter” sounds like an onomatopoeic portmanteau for a fart caused by a big belly laugh. A few years ago I used to get a lot of spam that consisted of a page or more of utterly nonsensical writing that seemed to have been randomly pasted together from novels. Like clauses and sometimes whole sentences made grammatical sense, but beyond that it was essentially gibberish. They were a little like reading a Dr. Bronner’s soap label, but without the religious fervor. As an apparent connoisseur of spam, do you have any idea what that was all about? There was no greeting, like “Hey what do you think of my novel!” They never asked me to click any links or unsubscribe or take any action at all. What were they getting or hoping to get out of doing this? If I understand my gibberish correctly, and I’m not at all certain I do, then this guy has a tough job. Not only is he a chief editor for his organization, but also the guy who carries the gun carrier. One wonders if the gun carrier is another person or some kind of conveyance. I think there’s a longer chain of command here. The Gun-Carrier-Carrier Chief Editor is the Editor who’s in charge of the Chiefs who oversee all the Carriers who are tasked with carrying the gun-carriers. Like you, I’m unsure if “gun-carrier” is a person or a conveyance. Given the delegation of duties displayed in that title, my money is on them being the people who get to carry the actual guns while being carried (either piggyback, Princess, or sack-of-potatoes style) by the Carriers (according to the directions from the Chiefs, as dictated by the Editor). I presume the gun carrier could be one of these https://en.wikipedia.org/wiki/Universal_Carrier which makes it a conveyance! I am definitely adding blooter to my collection of handy insults. It might be handy when discussing our current Premier. The spammer’s dilemma: If you write comprehensibly, your message will get caught is a spam filter, and the intended recipient won’t even see it, thus you fail to sell your stuff. Alternatively, if you mangle spelling enough to make sure your message gets past the spam filter, then your text becomes incomprehensible gibberish, thus the intended recipient won’t buy your stuff just because they cannot take you seriously and don’t see you as a respectable seller. The first time I looked at this message, I didn’t get it. I had to carefully read it twice until I finally understood that they are trying to sell a shirt. Making your sales pitch hard to decipher isn’t a smart marketing strategy, because people have a short attention span for advertisements. Moreover, substituting “click” with “CIN-ck” and “sale” with “salDµ” really doesn’t give me the impression that this seller ought to be taken seriously. Pretty sure those are accidental. They were trying to be all clever with Unicode and somehow got tripped up with character encodings. For example, the unicode code point for “CYRILLIC SMALL LETTER BYELO” which happens to look like an english lowercase i is 0x0456, or 00000100 01010110 in binary. According to the UTF-8 standard, in proper encoding this would be rendered in binary as 11010001 10010110. But if those values were misinterpreted as one character per byte instead of a two-byte UTF-8 encoding, we get code points 0xD1 and 0x96 – 0xD1 is “Ñ” and 0x96 is a control character often pressed into service as an en-dash, “–”. I think the other was an attempt to use “ȅ” in ‘Salȅ’. The sentence “At least the guys at the shooting range got a blooter out of it” has clearly been the victim of automated synonym replacement. “Blooter” is a Scots word meaning to strike forcefully, and all of the online usage examples relate to football (“blooter the ball”), so it’s gone in to somebody’s synonym database as a synonym for “kick”. The original sentence was “at least the guys at the shooting range got a kick out of it” – using “kick” in an entirely different sense.